Sharyn Overton was brought up at Lake Hawea but spent her high school years in Dunedin before returning to the Wanaka district, where she managed a busy instore bakery. Sharyn met her partner, Mike, in 1994 and together they successfully contracted to TBfree NZ in the vector control industry until 2016, first in Southland then the West Coast from 2006. 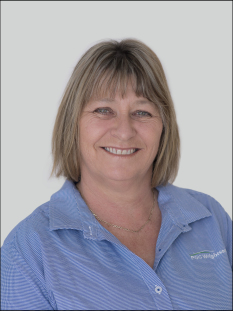 Through the pest control industry, Sharyn has gained very good negotiating skills and is confident of finding a successful outcome to every sale and purchase. Sharyn prides herself on her professionalism and attention to detail, is honest, reliable and knows the importance of listening to her clients' needs. You can trust that she will work with your interests at heart. Sharyn is a hard worker, is enthusiastic about starting her career in real estate and looks forward to working with you. She believes that good communication is the key to achieving objectives in all her business dealings.